Windows 10 may be set for release to general public soon, but it appears that the next version of Windows OS milestone still require some polishing, fine tuning, bugs fixing, and testing. The evident? Microsoft is releasing yet another preview build for Windows Insiders in the Fast ring. The newly released Windows 10 Technical Preview build is Windows 10 Build 10166. 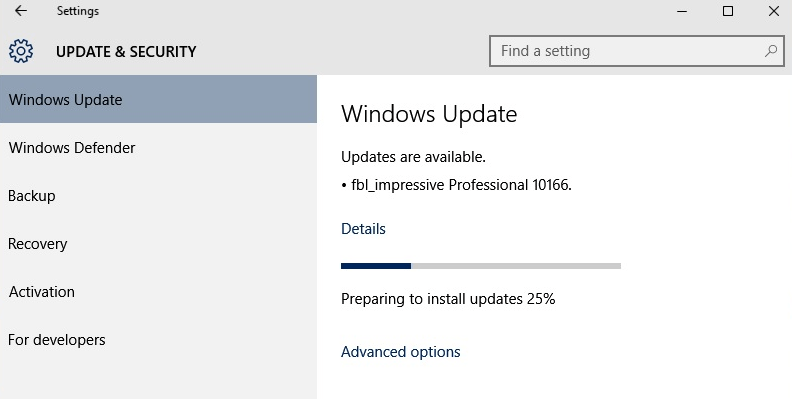 The complete build string number is 10166.0.150703-1818, and as usual, the buil is from fbl_impressive branch, where Insider Preview builds for Windows Insiders are normally from. The build was compiled a few days after Windows 10 Build 10162, which is the build Windows Insiders on Slow ring get. Windows 10 Build 10166 is available for download and direct upgrade through Windows Update. If you want to clean install a PC with official ISO, your currently available avenue is by downloading Windows 10 Build 10162 ISO, which is officially released by Microsoft, and then update to build 10166. Microsoft is yet to publish ISO images for Windows 10 Build 10166, which is also not available to Windows Insiders on Slow ring yet.